I’d presumed the whole of “Plunder” (1923) to be lost, so I settled for the 16 available minutes on DVD from The Serial Sqaudron’s The Lost Serial Collection , but it appears as though all 15 chapters are held (search “Plunder”) by the UCLA Film & Television Archive. Since I’m on the wrong coast for easy access to that, I’m pretty happy right now just to have had the opportunity to pick up the Serial Squadron DVD (Though, of course, if there’s anything more complete available on DVD please feel free to write me). I have no idea what's happening here, as it, or anything like it, was not included in the 16 minutes of Plunder that I viewed, but it looks pretty serious for Mr. Jones. Following the stills, Episode 9, Part 1 of “Gone Clean Through” begins playing. Backwoodsman Snake Jandus joins up with city slicker Jud Deering (Harry Semels) in order to lure Pearl into a batch of quicksand. Sinking deeper and deeper into the muck while her enemies celebrate and prematurely depart, Pearl finally frees herself by shooting free one of the vines overhead and using it to pull her way from the trap. Mounting her horse she races after Jandus and Deering, while in the meantime Deering turns on the Snake and disposes of him. Once Pearl catches up with Deering they actually have a little brawl which results in Pearl rolling down a hill and Deering riding off. End of Episode 9. What, no Warren William? Not in what’s included of Episode 9, no. Skip to Episode 15, the final portion of “Plunder,” titled “A King’s Ransom,” which after informing us that Pearl and Jones (Warren W. Krech, yep, that Warren William guy) are proceeding “with the business of having the skyscraper undermined and shored” (huh) returns us to the city (Okay, we haven’t actually been to the city yet, but “Plunder” is billed as a “mystery story of New York”) with the shot of a building exterior. Inside we see Pearl standing above a male figure who’s up past his waist in a hole that he’s chopping deeper into with a pick axe. 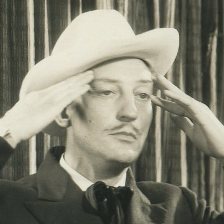 Just 28 or 29 depending upon the time of production, Warren William wears the familiar ghost white complexion of silent film, his hair is slicked back and the familiar mustache is not in place. Pearl joins him in the hole and together they dig and chop at the soil looking to unearth a chest the title cards have told us about. Outside the gates of the building Deering appears–he’s with a woman, with whom he confers, but there’s simply not enough here to know how she played into the story of “Plunder.” Deering climbs the gate and scurries into the building where hovering in the background he watches Jones and Pearl digging for booty. Finally, they find it. Warren William Krech’s Jones lifts the chest from the ground and he and Pearl celebrate by each raising a triumphant hand to the air and then shaking hands on a job well done. As Jones goes to crack the chest open Pearl discovers a smoking bomb tossed into their area by Deering. She hurls it in another direction and it quickly explodes knocking over pillars that held up the ceiling and bringing the roof down on Deering himself. Or rather the title card tells us that he says that, but any fan of Warren William’s can hear his crystal clear voice enunciating each syllable with a hammer-like exclamation coming at the appropriate punctuation. Meanwhile, outside of the building police and pedestrians have gathered at the gates and are hopping around outside driven close to a frenzy in response to the explosion. After making all of the appropriate gestures of shock they start climbing the gate with hopes of inspecting the damage. Inside Jones pries the chest open to reveal a pirate’s booty of jewels. It’s only at this point that the camera gets close enough to see Warren William clearly as he eyes the jewels in profile and then looks up at Pearl White who’s just as impressed on the right side of the frame. “Plunder,” written by Bertram Millhauser and directed by George B. Seitz for his George B. Seitz productions, was distributed by Pathe Exchange with a January 23, 1923 U.S. release date. It was filmed in New York, where Warren William’s Broadway career had been underway since 1920, though it is actually his second film following the previous years “The Town That Forgot God.” Following “Plunder” Warren Krech would concentrate his efforts on his Broadway and not make another film until he departed from the live stage once and for all and headed to Hollywood where he first appeared in “Honor of the Family” for Warner Brothers in 1932. Note: I don’t even know if it exists, but if anyone can put a copy of the aforementioned “The Town That Forgot God” to DVD for me, please feel free to contact me with details. Wow, that sounds like fun. WW in a newsie hat is weird, but it was 1923. It’s not as incongruous as his hat in Satan Met a Lady. When I first saw him in a still for that, I though, Bette Davis made a Western? And yeah, that silent film make up didn’t do anyone any favors. As one of the few (?) Warren William blog readers to have seen these “Plunder” clips before you did, I really love your write-up of them–terrific as usual. Especially your evocation of WW’s spoken delivery: “enunciating each syllable with a hammer-like exclamation coming at the appropriate punctuation.” That is marvelous. I didn’t really “hear” the title card so distinctly before, but I sure do now. Never doubt that I am out here reading avidly, even when (as is usual) I don’t have anything worthwhile to add! I can’t recall the hat, though I do think I’m the only person–ever–to like Satan Met a Lady. One day I’ll have to post what will likely be the first ever glowing review of the generally despised version of The Maltese Falcon. Hey Jeffers, how have you been. Thanks so much, I’m so glad to have apparently found the proper words to describe what I was watching–that’s part of why I love posting to here pretty much right after I watch something. When I write about other movies I generally watch them at least 3 times before I start typing, and while that can be the case with Warren William movies (for instance, I watched Outcast twice before writing about it tonight) I prefer to post here right after I see something in order to capture exactly what I saw and/or felt. Glad you’re still around. Hope I’m making good on my promise of posting more regularly here. For what it’s worth, I was really impressed and delighted with the Arthur Treacher and Marie Wilson performances in Satan Met a Lady, and there were other good performances and aspects of the film, but it was another one in which I was disappointed at not liking WW’s role, in other words, not being able to hold it out to any potential WW fans and say, “Just watch this and you’ll see how great he is,” which I guess is always in my mind when I see one of his movies for the first time. Of those I have seen, I would still go with Skyscraper Souls and Employees’ Entrance among “major” pictures and “Case of the Curious Bride” and “Case of The Lucky Legs” on a sheer-fun level when casting my nets for new converts. Still keeping my eyes peeled for The Mind Reader and The Match King to reappear! Our pal, Jennythenipper, actually beat me to giving out any kind words to Satan Met a Lady on her post about the Maltese Falcon box set. BTW Jeffers, The Mind Reader is on that list I posted in reply to you on the “Outcast” post. Yup, can’t go wrong starting with either SS or EE when looking for converts. In fact, I used Employees’ Entrance to show one of my best friends, who hates “old movies,” who WW was, and after offering to stop it 5 minutes in he declined and told me he’d like to see the rest…and he liked it!